For over a century, the Mississippi River has been a means of conveyance, floating huge objects to a final destination. Nowadays, it is barges, tied together and pushed by tugboats. But from the Civil War until early in the 19th century, the main objects on the river were log rafts. Hundreds of logs – mostly white pine — were lashed together on the shores of the Chippewa and St. Croix Rivers in northern Wisconsin, then floated down the Mississippi. Sawmills to process those logs dominated the landscape and the economies of area communities. Thanks to Frederick Weyerhaeuser and his brother-in-law F. C. A. Denkmann, Rock Island and the Quad Cities were a destination for many of those logs. another sternwheeler at the head of the log raft. That smaller boat is perpendicular to the logs as well as to the river’s flow. It was designed especially to steer the log raft and was known as the “bowboat.” Floating logs were harder to stop than to start. A different view of a log raft from with the bow boat in the foreground shows the configuration more accurately. In the background is the Crescent Bridge, which indicates that the picture was taken looking west from near where the Centennial Bridge is now – probably the photographer was standing near the top of another riverboat. Men are visible atop the log raft but it isn’t clear what they are doing. Since the outline of the log raft is very irregular, it may be that it is in the process of being broken into smaller rafts, which will then be stored in pens near their sawmill destination, until they can be sawn. Weyerhaeuser & Denkmann maintained their first sawmill just around the bend downriver, at First Street and Fourth Avenue, where a barge terminal is located today. There had been sawmills in the Quad City area since the 1830s, and the one on the end of Fourth Avenue was one of the oldest. Weyerhaeuser &. Denkmann acquired this sawmill, located just north of the Kahlke boatyards, around 1860. In the very early days, local sawmills cut hardwood timber from the nearby bluffs. As the nearby local lumber was cut, Weyerhaeuser and others looked elsewhere for a source of logs. They found it in the woods of northwestern Wisconsin. 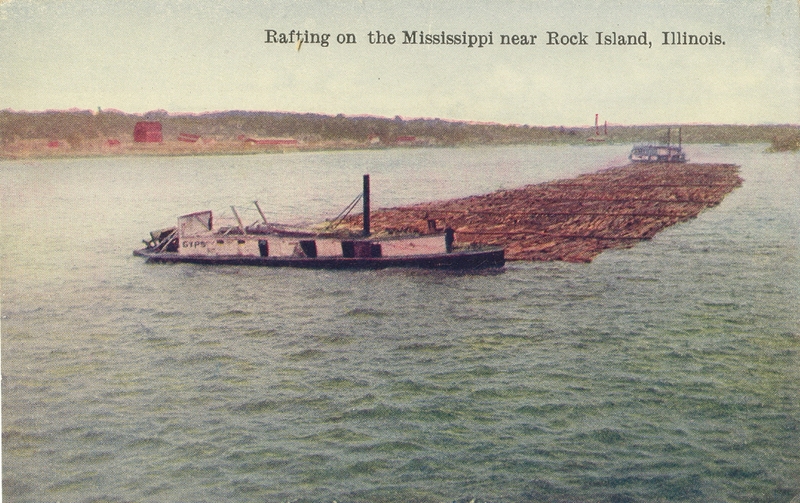 Huge white pine trees were cut and floated down the rivers to Rock Island and other destinations. In the very beginning, the logs were simply dumped into the river up north and fished out at their final destination – but big logs floating uncontrolled down the river were not conducive to navigation safety. It didn’t take long until the logs were tied together, forming huge rafts. 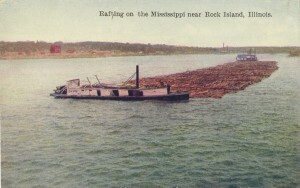 The raft depicted on this postcard is relatively small, as the average length of a raft was about two blocks long. The largest log rafts were three blocks long and a block wide. But even when lashed-together, a large pack of logs can be a navigational hazard. The problem of controlling the travel of the rafts was solved when Rock Islander Sam Van Sant invented the special purpose raftboat to push the log rafts. In Rock Island, Weyerhaeuser and Denkmann owned their own raftboats, which were built at the Kahlke Brothers boatyard next door to the sawmill. The pictured North Star was, therefore, likely built locally As an aside, Sam Van Sant later became the fifteenth governor of Minnesota (1901-1905), but did return to visit in Rock Island. Rock Island had two big sawmills, both eventually owned by Weyerhaeuser & Denkmann. The first was their west end one at Fourth Avenue. F. C. A. Denkmann and his wife lived nearby at 122 Fourth Avenue. The second Weyerhaeuser & Denkmann sawmill was located near the foot of 27th Street, in the “Y” formed by the railroad tracks, where some of the tracks curve to go across the Sylvan Slough bridge. In later years, the 27th Street mill continued in operation as Rock Island Sash and Door. By the late 1800s, when the easily floated trees in Wisconsin or Minnesota were all cut, it was found to be uneconomical to log inland from the rivers. With foresight, Weyerhaeuser & Denkmann looked farther afield to the rich forests of Washington and Oregon. The company eventually moved to the northwest and where they became the largest timberholders in the United States, both as a firm and as individuals. November 18, 1905, at 8 pm marked the end of the sawmill era in Rock Island. That date and time is variously reported as either the arrival of the last log raft or the time the west end sawmill turned its saws off for the last time. 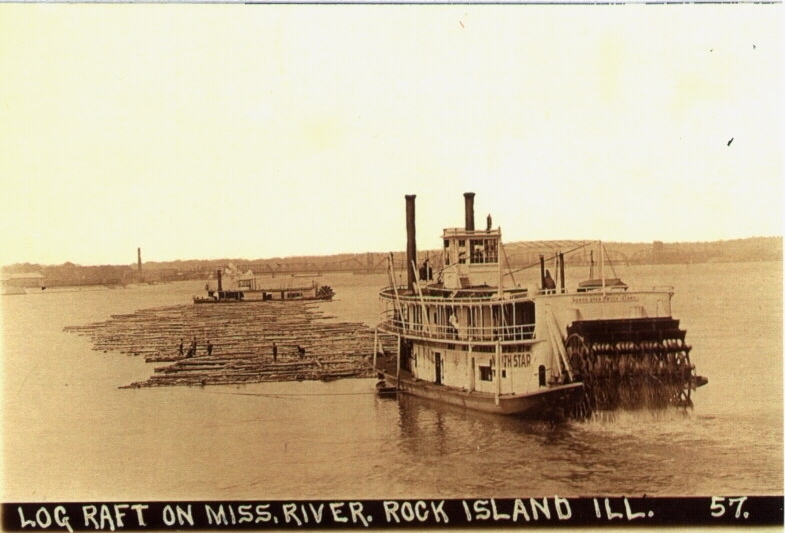 So why do surmise that this postcard might depict that last log raft destined for Rock Island? It depicts a Rock Island boat, and Weyerhaeuser & Denkmann operated the only Rock Island sawmills. This raft is downstream of the 27th Street sawmill, probably destined for the west end sawmill. The Crescent Bridge in the background wasn’t built until 1900, so the approximate date of the card is known. Thus this postcard might be more significant than a first glance indicates. It marks the end of the historic sawmill era – an era that contributed mightily to our city and our community. Although a few log rafts continued down the river after 1905, they went to other sawmills in other communities. The summer of 1915 saw the last log raft, of Minnesota white pine, pushed down river by the Ottumwa Belle. Memories of sawmill years lingered in Rock Island, even though that last raft changed our history forever. For years after the mills closed there was more than just memory –there was smoke. One of the byproducts of sawmills is sawdust. Lots of sawdust. After decades of sawing wood, the mills were pretty much surrounded by sawdust, covered by layers of river silt. As a result, even 20 years after all the local mills closed, there were underground sawdust fires. In the west end sawmill area, sawdust fires regularly occurred along the river from Third to Thirteenth Avenues. Today’s riverfront path provides access to both of our historic sawmill sites walking or on a bike. Check it out, and notice the photographic RiverWay markers near the Kahlke boatyards in the west end and the other near the railroad bridge at 27th Street. The 27th Street photo shows another log raft, penned up awaiting sawing in the adjacent sawmill. This article by Diane Oestreich is slightly modified from the original, which appeared in the Rock Island Argus and Moline Dispatch on February 3, 2002.